A 1906 map of Taal Lake and Volcano, including surrounding areas. 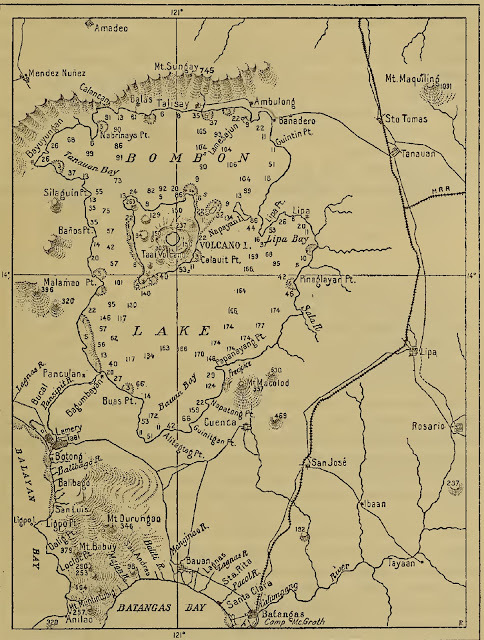 The map above has been extracted from a digital copy of a 1906 edition of the Philippine Journal of Science1. It shows Taal Lake and Volcano with a north to south orientation. Because the map has an extensive coverage and includes Cavite to the north, Balayan Bay to the west, Batangas Bay to the south and towns such as Rosario and Ibaan to the west, it is for all intents and purposes also a map of the Province of Batangas in the era. It even includes, although a legend is not included, a trace of the Calamba to Batangas Town railway line. 1 “The Philippine Journal of Science: Volume XI,” Alvin J. Cox, General editor, published 1906 by the Bureau of Printing, Manila.